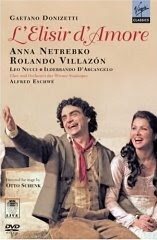 I have finally gotten my hands on a copy of Donizetti's L'Elisir d'Amore from the Wiener Staatsoper with Rolando Villazon and Anna Netrebko. This fabulous cast also includes Ildebrando d'Arcangelo as the doctor and Leo Nucci as the flirtatious sergeant. With his short pants and curly hair Rolando makes the perfect adorable village idiot. He juggles, he dances. What else could a woman want? Anna in her normal persona easily projects the bookish Adina who feels herself too good for the humble Nemorino. The elixir, which the doctor confesses is bordeaux, makes Nemorino suddenly self-confident and attractive. He flirts with other girls, and jealousy reminds Adina that she does indeed love him. This filming includes something I have never personally experienced. At the end of Rolando's exquisite performance of "Una furtiva lagrima" the audience goes absolutely wild with shouting. Rolando stands waiting for the ovation to die down, and when it doesn't, he nods to the conductor. The conductor whispers to the orchestra. Papers are shuffled. So it is still done in the rarefied atmosphere of the Vienna State Opera--"Una furtiva lagrima" is encored! And it's even better the second time. They are simply unbelievably adorable, and this is their most perfect casting. They were born to play these parts. They are so cute you want to go up and pinch their cheeks and say "You are soooo cuuuute!" Old ladies can do these things. The sound is a bit disturbing, at least at the beginning. The chorus is quite loud in comparison to the soloists and it's necessary to keep cranking the volume up and down. Opera Colorado is wrapping up its current run of "Elixir," which director James Robinson recast into a Grant Wood-esque 1910 rural America setting. Barry Banks is terrific as Nemorino - he also sings the role in English on a Chandos recording from a few years ago. The singing was excellent and the staging was delightful, much easier to assimilate than some of Robinson's earlier efforts, such as resetting "Giulio Cesare" as a WWII epic. That was just plain silly.